This shop has been compensated by Collective Bias, Inc. and its advertisers. All opinions are mine alone. 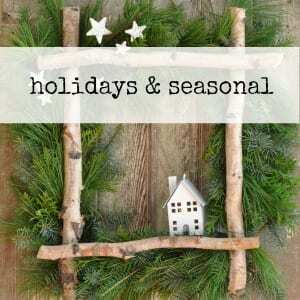 #SutterHomeForTheHolidays #CollectiveBias The following content is intended for readers who are 21 or older. 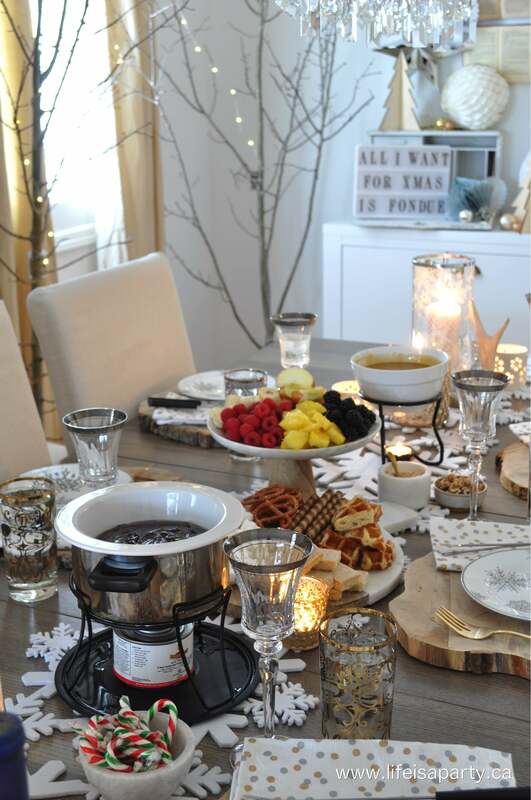 Christmas Fondue Party: Make an entire evening out of fondue, with cheese fondue, oil fondue, chocolate fondue, and caramel fondue. 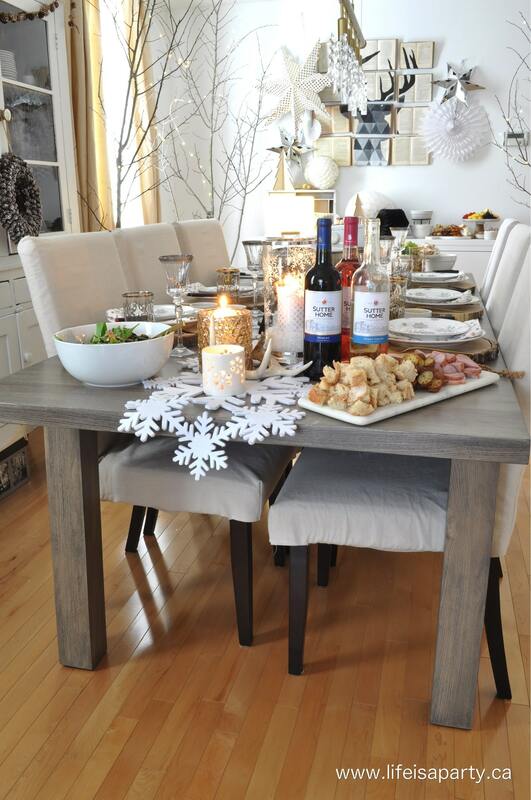 Perfect easy entertaining for the holidays. 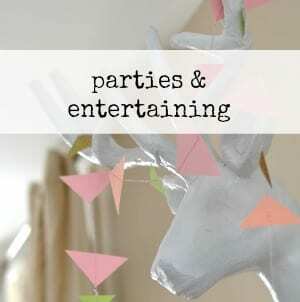 I love to entertain and especially around the holidays. But sometimes you spend so much time hosting that it’s more tiring than fun…anyone been there? 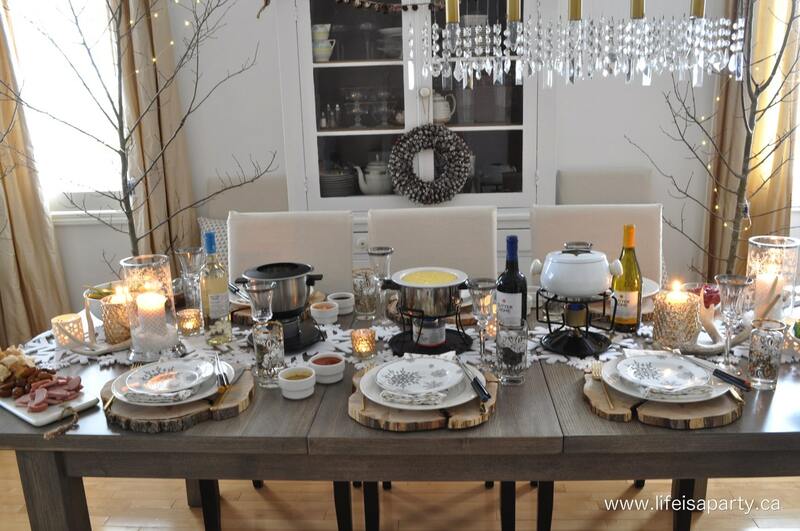 Hosting a wine and fondue party is the perfect way to get to be a guest at your own party. 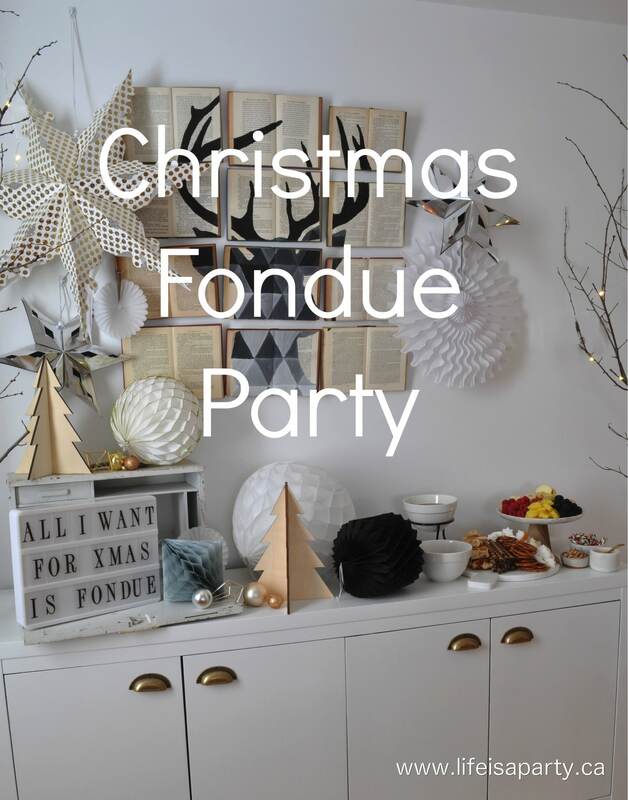 This Christmas Fondue party is so much fun, easy to put together, and a fun retro idea for the holidays. 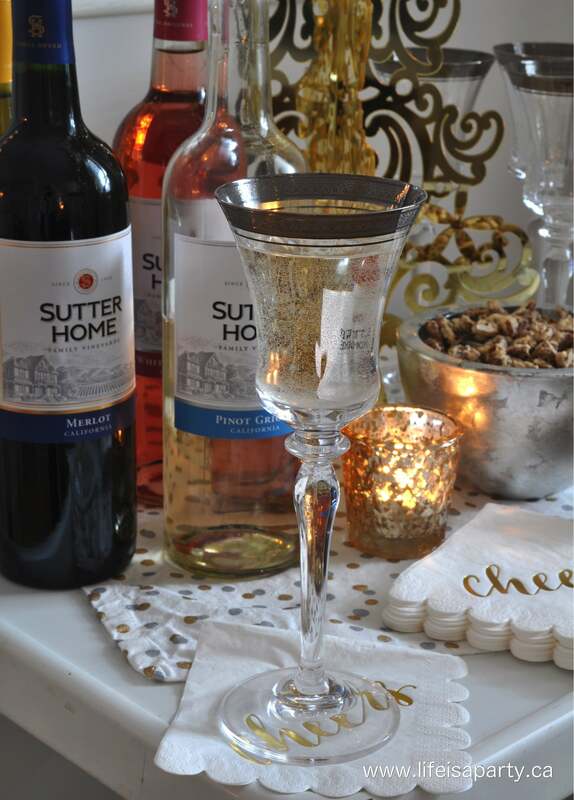 As your guests arrive it’s lovely to offer them a drink from Sutter Home Family Vineyards to get in the festive spirit. 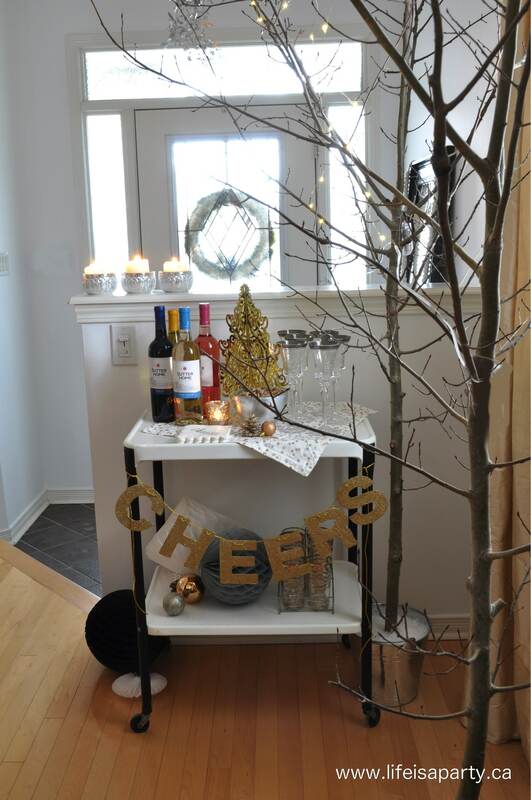 I set up a wine bar near the door. 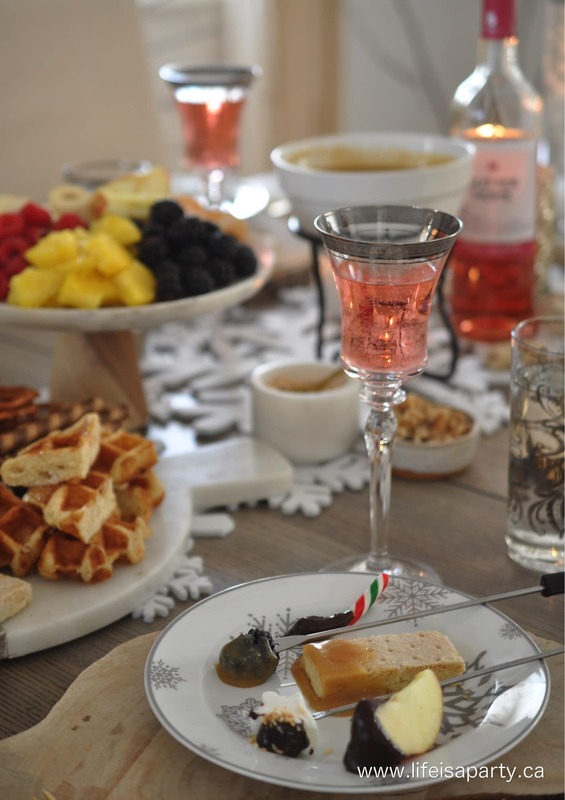 It makes it easy for guests to serve themselves through out the evening, and is a great way to welcome them in with a lovely glass of Sutter Home Wine. 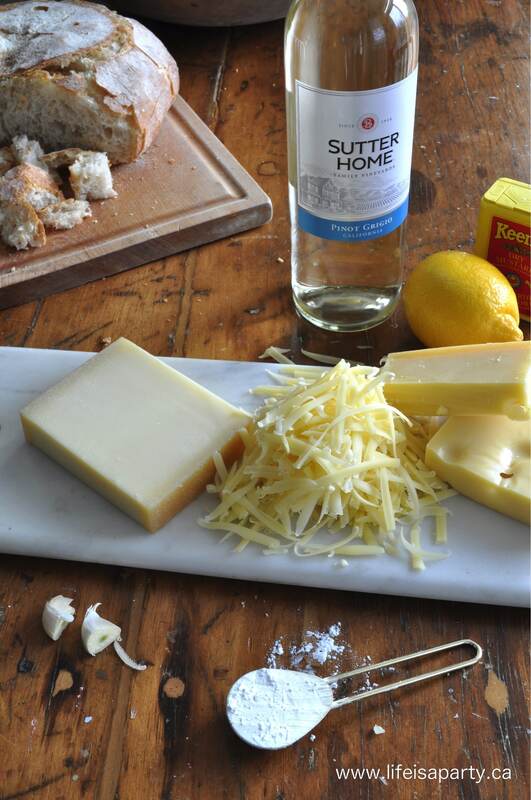 Sutter Home Family Vineyards Wine is the perfect wine to bring people together and make them feel at home. 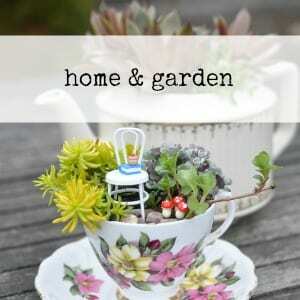 With so many different kinds to choose from at a great price, there’s truly something for everyone. 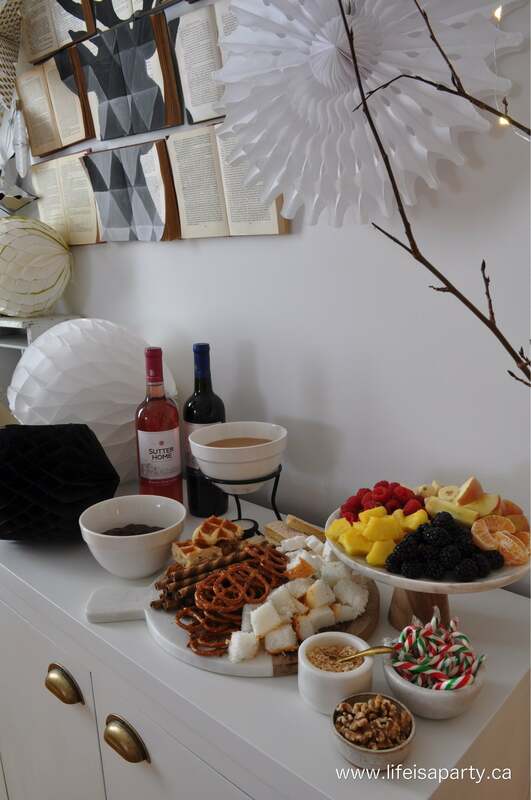 Wine and cheese are the perfect pair, and inspired the wine and fondue theme. 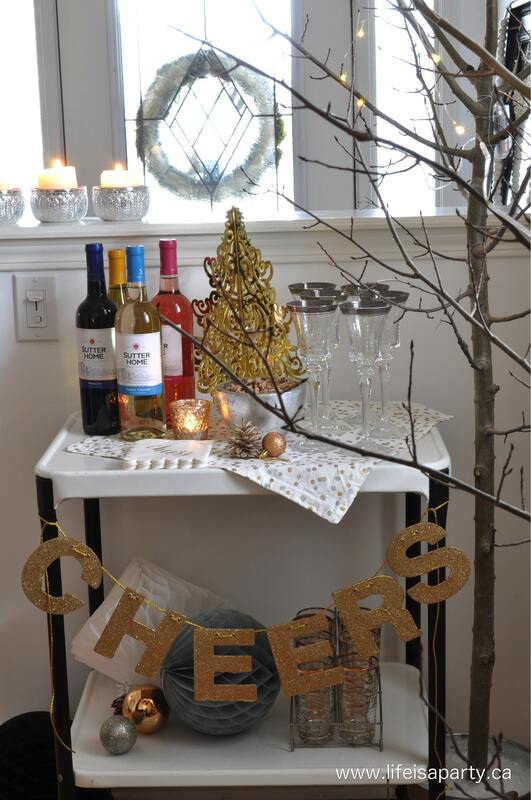 I set the table for the party and tried to make it warm, welcoming and festive. 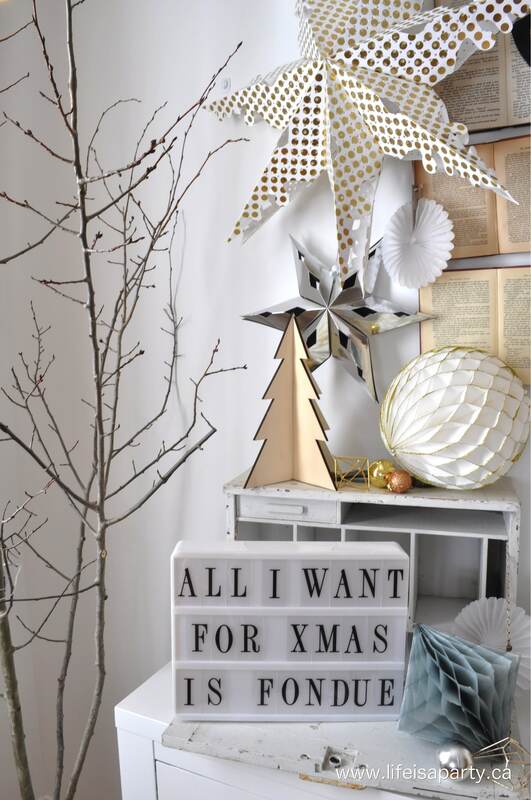 My dining room already has a Christmas forest theme, so I added in some snowflakes and lots of silver and gold for the party. 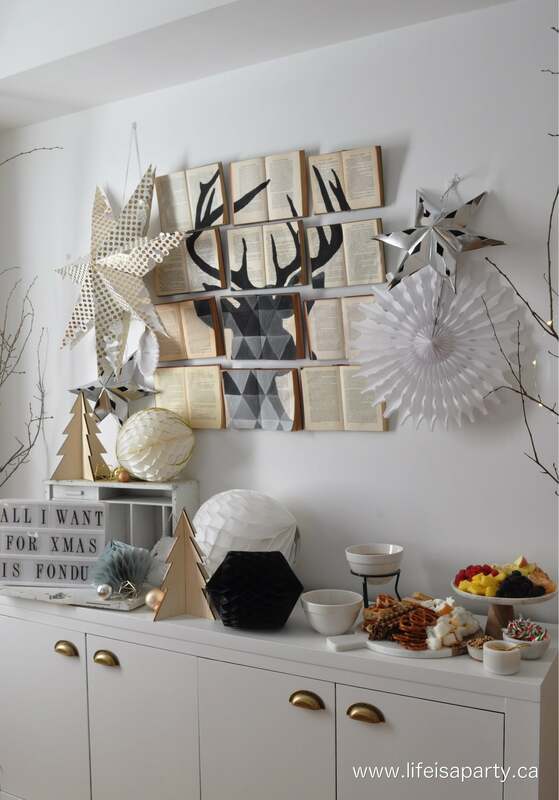 It’s great to add in some pretty paper stars, and honeycomb balls to really make it feel like a party! 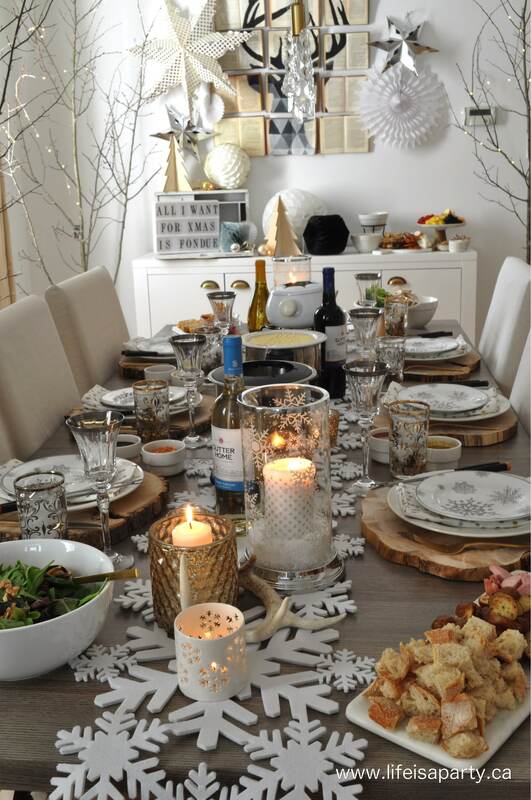 I had lots of fun setting the table too. 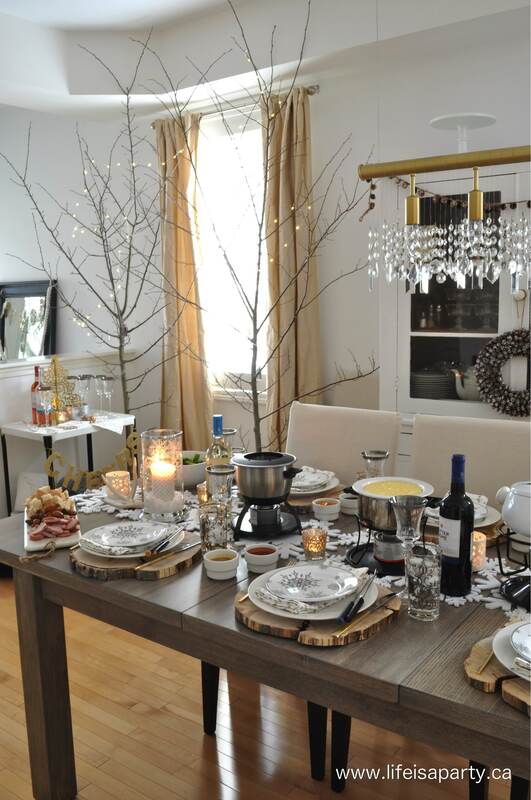 I used wood chargers for the table -I love the mix of the gold and silver with the rustic wood and antlers -strikes the perfect balance for a holiday table where you want a little bling and sparkle, but love the rustic style too. 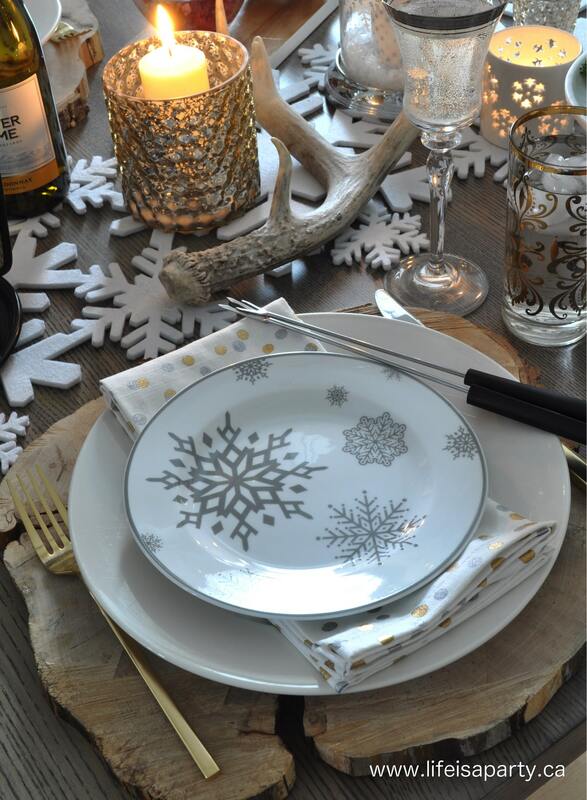 And the snowflake plates, table runner, and candle holders definitely add to the winter wonderland feel in the room. 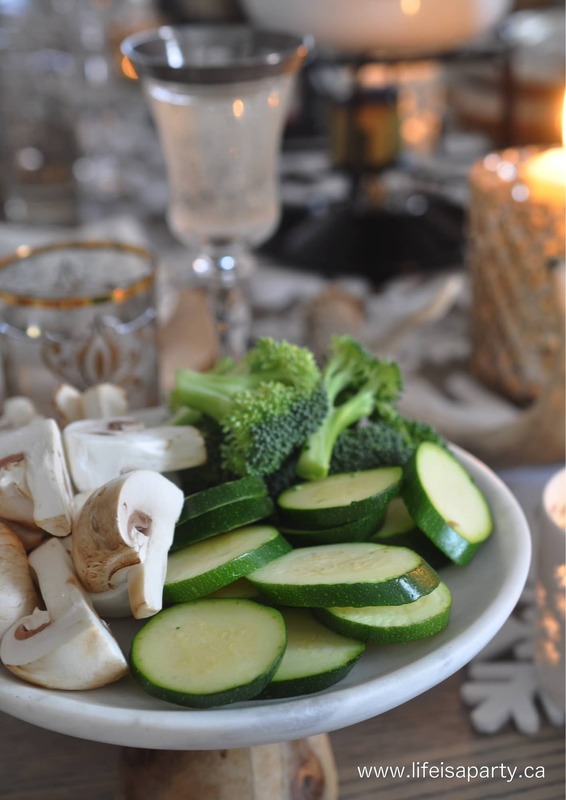 This is the kind of meal where the guests linger. The fondue takes a while to cook, you tend to chat, and cook, and eat, and sip your wine, and then do it all over again. 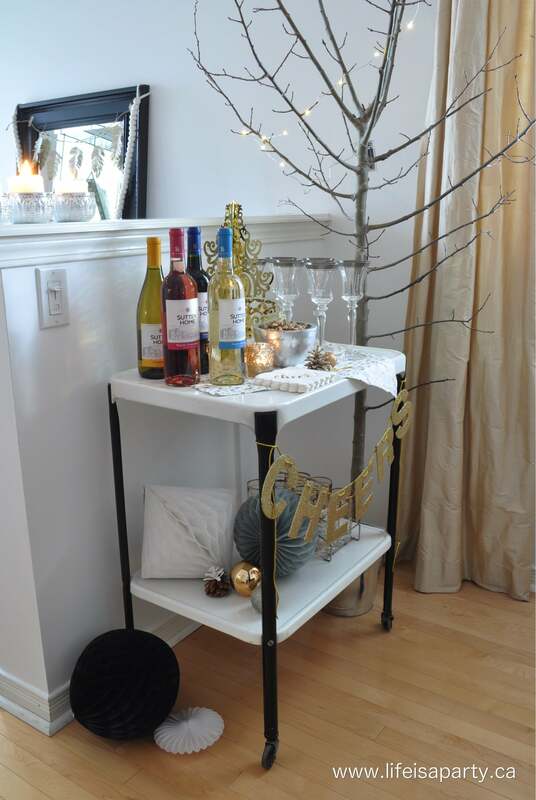 It’s absolutely the perfect holiday girl friend get together. You’re not stuck in the kitchen, and it turns into a long, relaxed evening. Honestly, I’d forgotten how fun a fondue party is, until I went to the basement to find all the fondue pots and start setting up. I started the evening off with a cheese fondue, and oil fondue. 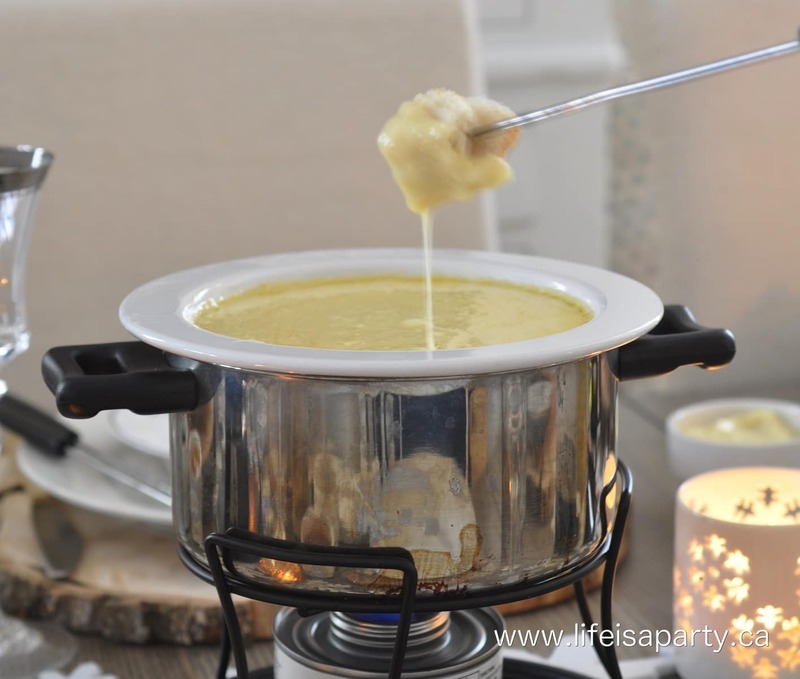 The cheese fondue is really easy to make, and I promise it’s so, so good. 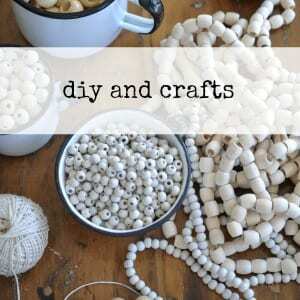 Start by rubbing the inside of your pot with the garlic clove cut in half. Then add the wine and lemon juice to the pot and heat to a simmer over a medium heat. Coat the grated cheese with the cornstarch by shaking in a sealed zip bag. Slowly add the cheese to the wine mixture, handful by handful, stirring in a figure eight pattern to incorporate it each time until it's all mixed, creamy and smooth. Add in the brandy, dry mustard and nutmeg and stir to combine. 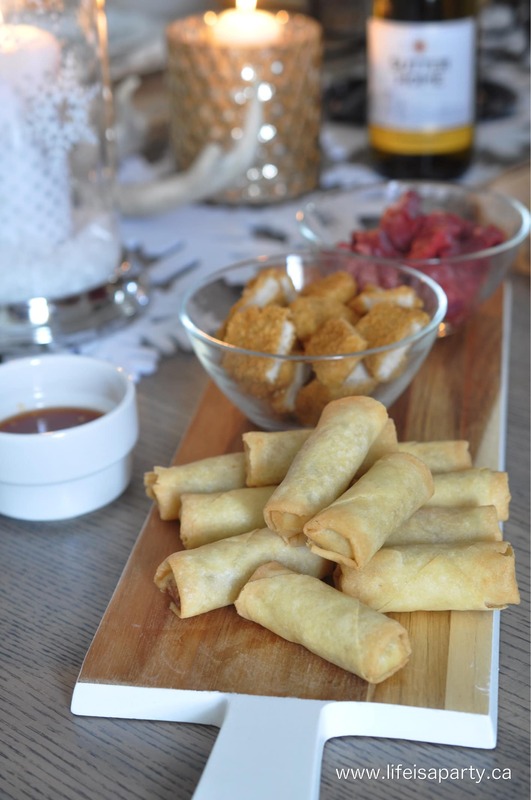 Serve in a fondue pot with assorted dippers. 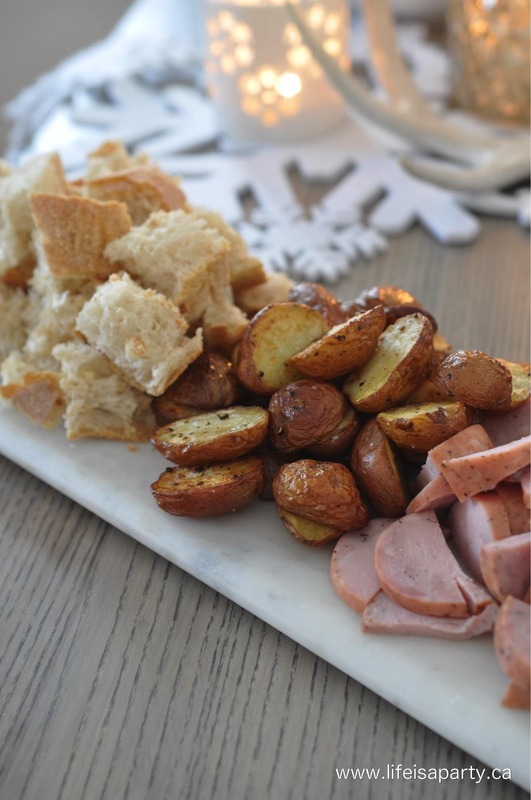 I served the cheese fondue with some beautiful fresh crusty bread from the bakery, roasted mini potatoes, and some kielbasa sausage. Such yummy dippers. In fact, most of the dippers were picked up at the store, so other than making the three fondues ahead of time to re-heat before serving, all I had to do was roast a few potatoes and do a little slicing. Another reason this party is so much fun, it’s pretty easy to put together. For the oil fondue, I set up two pots of oil. Just bring the oil up to 375 degrees on the stove and then set them on the fondue stand. I served some beef, chicken, and egg rolls. I used frozen chicken fingers that had been thawed and cut into pieces. The egg rolls were also frozen -already fully cooked so you’re just crisping them up in the oil. For the raw meats, be sure to keep them separate from the other food, and make sure they’re fully cooked before eating. Let everything come up to room temperature just before serving to reduce cooking time and help your oil stay hot. One of the fun parts of oil fondue is offering lots of sauces to go with the meats. I served teriyaki sauce, plum sauce, asian dipping sauce, chipotle mayo, truffle aioli, and honey mustard. I also offered some tempura vegetables. Just slice the veggies -I used zucchini, mushrooms, and broccoli, into small pieces, and make a tempora batter -see my recipe here. 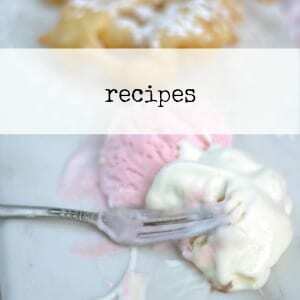 Guests can choose a veggie, dip into the batter, and fry in the oil. These are so, so yummy. 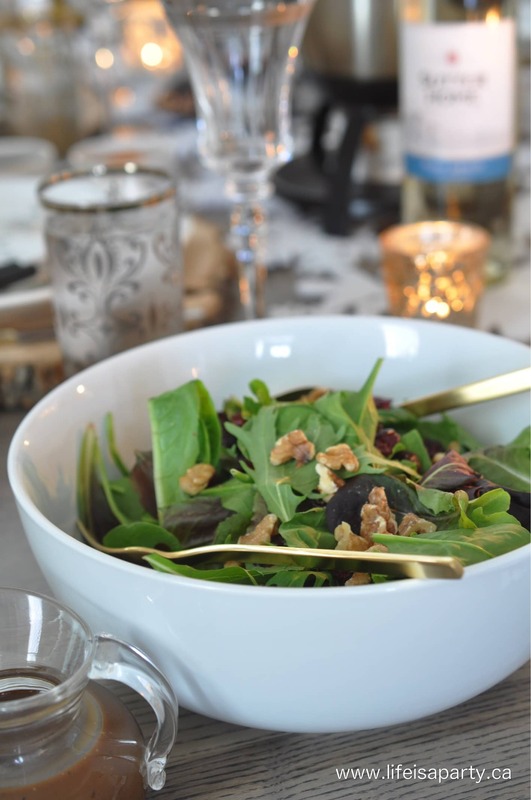 Since the fondue is so rich, a green salad helps round out the meal. After dinner, it’s time for the dessert fondue. 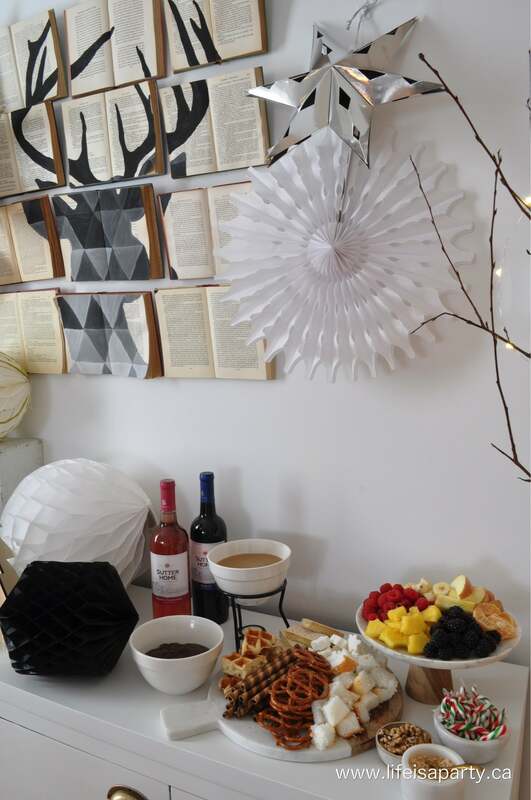 I prepped all the desert before the party and set it up on the side. This way, I don’t have to head back into the kitchen and get back to work in the middle of the party. I just reheated the chocolate and caramel fondues in the microwave when it was time to serve (this works great for any leftovers too). For the chocolate and caramel fondue -see my recipe here, the sky is the limit for dippers. Fresh fruit is delicious. 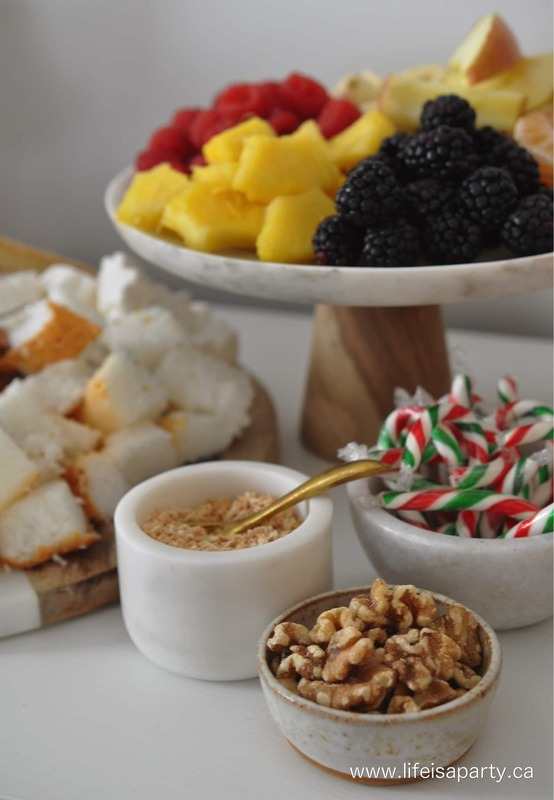 I also included some nuts, toasted coconut to sprinkle over your dipped fruit, and candy canes for a Christmas touch. 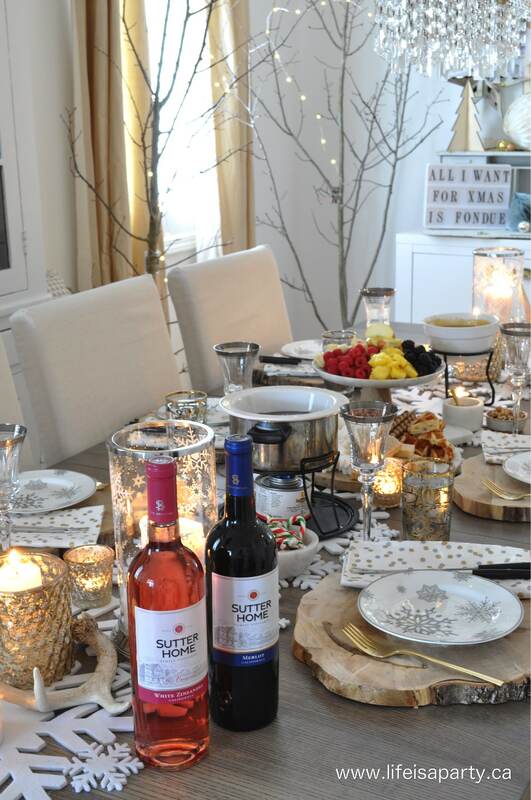 Since dessert is sweet, a sweeter wine like Sutter Home White Zinfandel is the perfect pairing, or Sutter Home Merlot goes with the chocolate so well. I also included a tray of other sweet dippers; shortbread cookies, marshmallows, angel food cake pieces, belgium waffles, chocolate cookies, and pretzels for those who love sweet and salty. We moved everything over to the table for dessert. 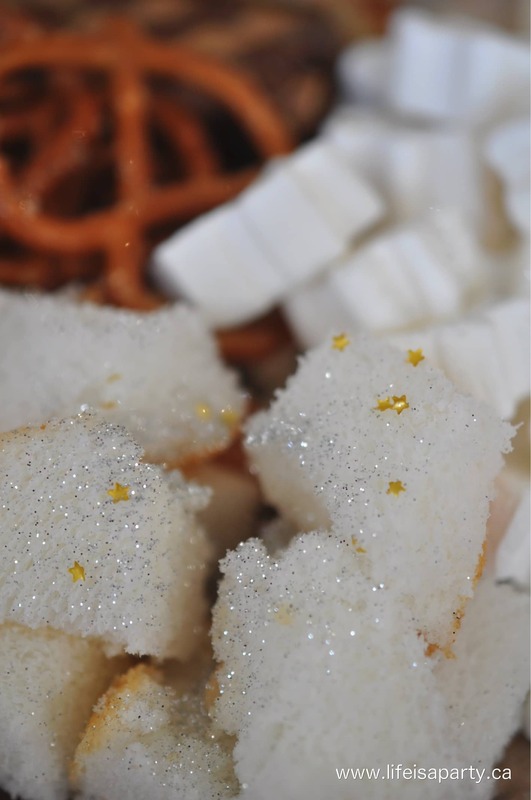 And you thought guests lingered at the table for dinner, wait until dessert. No one will want to leave. The chocolate fondue is in a double boiler fondue pot. There is water in the pot, and the ceramic bowl with the chocolate is sitting in it so it doesn’t burn. I also used this one for the cheese, and it really works well. If you don’t have enough pots to host a party though don’t worry. Most of these were picked up at thrift stores. They’re easy to find. 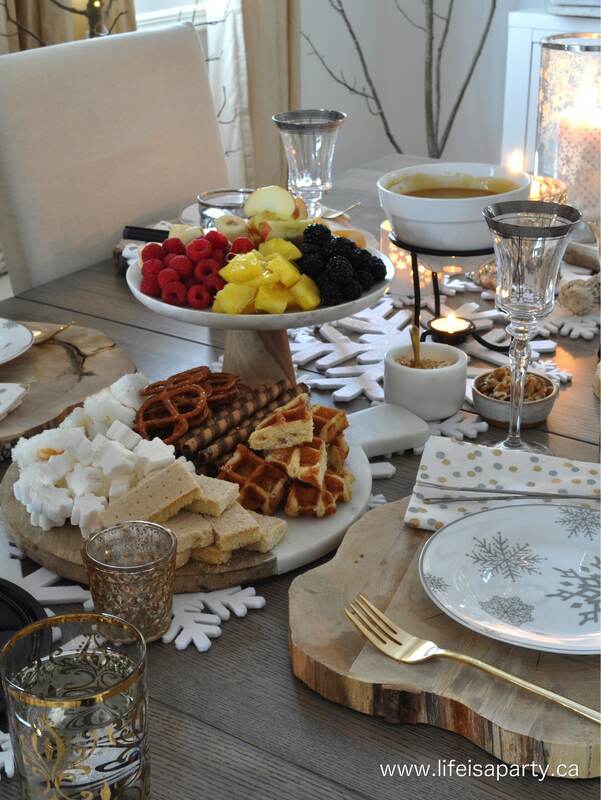 This really is the perfect holiday get together. It would be an amazing idea for New Years Eve too. 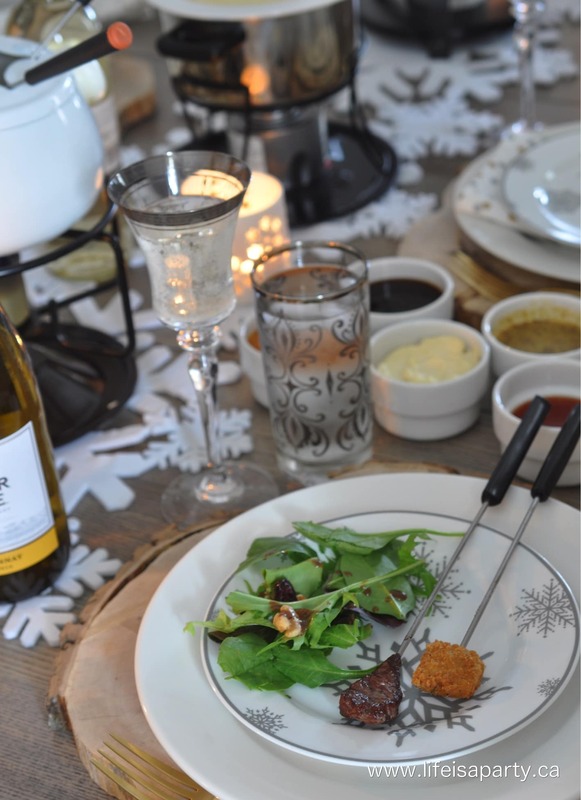 With a Christmas Fondue Party to celebrate with girl friends, life really is a party. This is beautiful! Tempura vegetables?? At a Fondue? OMG! Can’t wait to try!